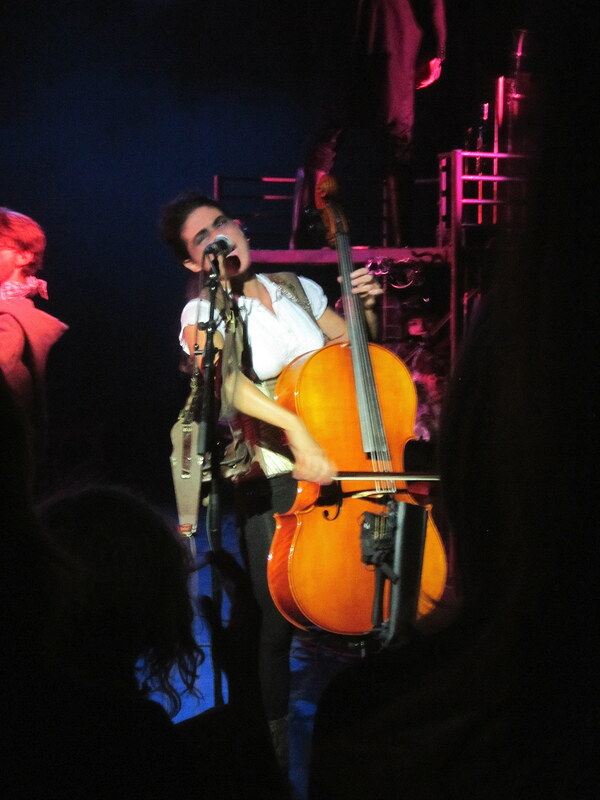 “The Mechanisms were created by Dr Carmilla to form her backing band in late 2010. When the doctor decided to concentrate on her solo work, they threw her out of an airlock and struck out on their own. They work mainly from their homeport of Oxford, but since 2012 they’ve also presented several well-received shows at the Edinburgh Fringe Festival. For more info visit their website and for music, check out their bandcamp site. In all, the Mister and I saw 10 performances and went to one awesome whisky tasting during our time at Edinburgh Fringe Fest, but I couldn’t devote an entire article to each one. Some things were too short for their own post or fell short in terms of quality, and I didn’t want to devote entire posts to negative feedback. But, by putting everything on my posted itinerary it looks like I am endorsing it all, and I can’t say I’d recommend everything I saw during my week at the Fringe. So here is my final set of reviews for the rest of what I saw in the order that I saw them. I was excited for this hour-long performance that promised to explore Edgar Allan Poe’s imprisonment in the Moyamensing prison in 1849. Unfortunately, within the first 10 minutes I wished I had been one of the lucky ones who sneaked out while “Poe” was off stage. The entire tale was told at a decibel level that hurt my ears, and even though the one-man show was supposed to be told through several characters, the only thing that changed about the delivery were the hats he wore. I thought that I was going to get a piece of Poe-like story-telling, with suspense and just the right sprinkling of grotesque, but the delivery was off-putting and the story just plain gory. There are a few different City of the Dead tours, and this one takes your group to Greyfriar’s cemetery. I love these kinds of tours and the guide was just as engaging as I’d hoped. 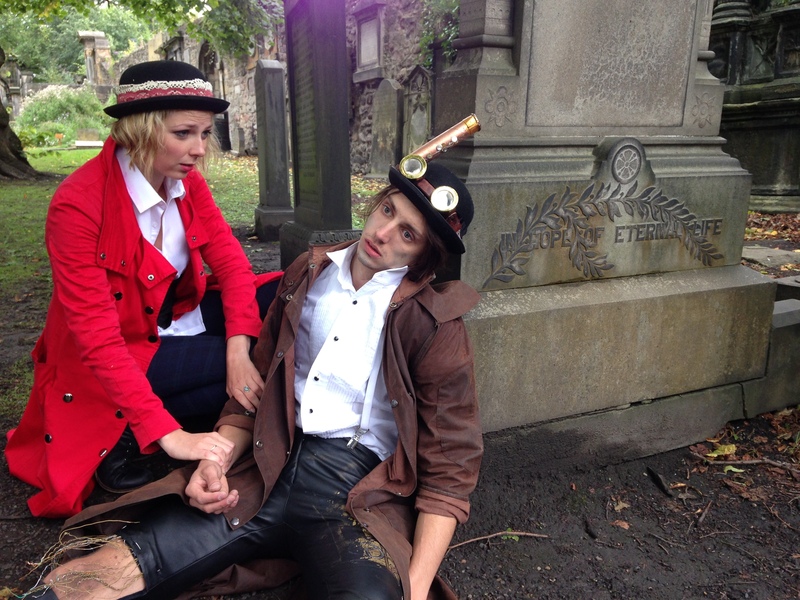 There was just the right amount of humor to offset the truly horrific details of Edinburgh’s past and their dealings with their dead. If you like true stories of the darkest pieces of history, definitely check this one out. The Arthur Conan Doyle Center is housed in a beautiful Victorian townhouse on a lovely street. The lecture took place in the sanctuary for the Edinburgh Association of Spiritualists, though the speaker was specifically not going to be talking about spiritualism. She focused instead on the time in Conan Doyle’s life that he lived and worked in Edinburgh and focused on trying to tell the audience things they might not already know. Unfortunately for me, I didn’t know much about his life at all to start with, so the lecture felt sort of scattered and there were many times when she started a sentence with “And as you already know” and ended with “so I won’t go into that.” So if you are looking for an intro to this amazing writer’s life, I’d start somewhere else. This was clearly meant for people who already had some background knowledge. The Center itself is worth a quick look if you are in the area. The upper levels are accessible in all of their Victo rian splendor, and there is a gallery space that is lovely and bright. The Center offers yoga and other practices to enhance your mind-body connection, as well as studio space for artists. I thought there would perhaps be an exhibit or something about the man himself, but alas, there are just books in the gift shop. So don’t plan on spending more than a few minutes there if indeed you go at all for anything besides a lecture. This was a totally different way to present the tale of Dorian Gray from the manner of Victorian Vices. In this version the actors were all in black and white, including their painted faces. They never revealed the portrait to the audience, but used a large canvas on stage that was smeared with “blood” by Dorian’s victims after their deaths or ruination. The show moved far too quickly, even the lines were delivered rapid-fire, so it ended up feeling like the Cliff’s notes version of The Picture of Dorian Gray and lasted maybe 20 minutes total. But the proceeds go to a charity so if you are in the area and have half and hour to kill it is an interesting little show. I didn’t actually put this on my formal itinerary because it was an free, non-ticketed event and I wasn’t certain I’d make it there. The small but appreciative crowd assembled inside The Wee Pub in a wonderful little room complete with a beautiful old-timey fireplace and lights. Unfortunately, the large picture window overlooked Greenmarket Square and there was a lot of activity outside. The music of the street musicians really detracted from the tales of horror and made it difficult for the actor to build the kind of suspense that he was going for. David Crawford has a wonderful voice for telling scary stories, and I’d love to see him again in a different setting. He asked for suggestions after the show because he is planning to have some engagements in the US, so maybe you will get a chance. When I got my tickets for this Steampunk rendition of Bram Stoker’s novel I had no idea it was a world premiere. The packed house was rowdy even for a 9:20pm start time, aided no doubt by the chaos in the Pleasance courtyard below. The set is composed mostly of low scaffolding that is used athletically by the extremely physical Dracula and co. I love a show where the actors are also the musicians, and this ensemble included not only the essential elements of a rock band, but also a violin, bass, flute and cello that were expertly played and nearly flying across the stage in this extremely energetic performance. The costumes were fantastic, especially those of Mina and Lucy and I coveted every corset. 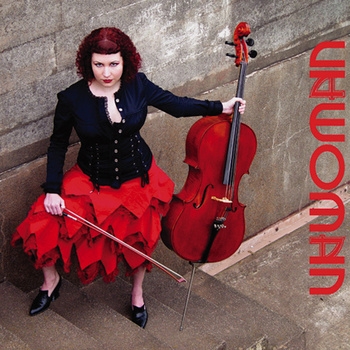 Dr. Joanna Seward rocking the strings. The director, Alexandra Spencer-Jones, made some interesting choices with gender, most obviously making Doctor Seward female. One of Dracula’s ‘wives’ was male, which also added an interesting twist to the story that everyone thinks they know. This was definitely an adaptation of the famous movie, using many of the details that were added to the film that never appeared in the book. But, they made some other additions like great stage combat and a more empowered Mina for their own flavor and I really enjoyed the whole performance, which included original songs as well as covers of some unexpected ones. The only downside was the audience itself. One girl in my row got nauseous from the special effects blood (of which there is a lot, so be prepared if you are squeamish), but the worst were the idiots who laughed over and over at inappropriate moments. For some reason just the name Van Helsing elicited giggles. These were also the same people who gave a standing ovation at the end though, which makes me think they were probably friends and family of the actors and were reacting more to seeing their loved ones acting strangely than to the acting itself, which was great. Renfield’s crazy and Lucy’s delirium were fantastic, and the manic Dracula was alternatingly sensual and spasmatic (in the best possible way). The company, Action to the Word, has been touring all over the world with its version of A Clockwork Orange, and this is their newest addition to theater scene. There is more than one Dracula at Fringe this year, so make sure you get tickets for the right one! I know it is cheesy, but I love magic shows. I remember snuggling under the covers in my parents’ big bed in order to watch them on TV when I was a kid, and I still get a kick out of seeing them as an adult. Not the overwrought, super dramatic ones, mind you. I like my magicians a bit cheeky and out to have a good time, and Morgan and West definitely delivered. I saw some great tricks that I have never seen before, and their concept of Victorian-era time-traveling magicians is hilarious and oh so Steampunk. I won’t go into details because I don’t want to ruin the fun for people want to go and see them at Fringe and on their tour, but let me just say the diary trick still has my head spinning. Their onstage chemistry is great, and make sure to queue up early before their show so you get a chance to interact with them while you are waiting in line. One tip for you Fringe goers. Try to sit in the front half of the theater. I was sitting in the back and the sight lines were fine, but I could hear a msucial act going on in a different venue and it was a bit distracting and they deserve your undivided attention. Uppingham, Uppingham Theatre, 6.45pm show. Brighton, Brighton Comedy Festival, 4.15pm show. Aberdeen, Lemon Tree Theatre, 7.30pm show. I saw the trailer for the Oxford run of this show about 2 months ago (you can watch it by clicking here), and I would sometimes find myself singing the haunting melody from the promo without even realizing I had started. 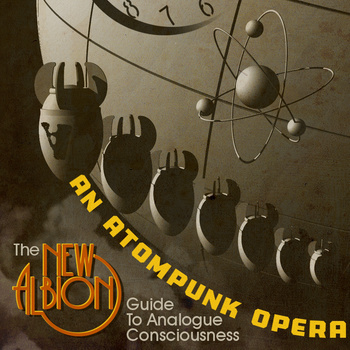 I was so excited for the concept, a steampunk progressive rock opera, but I made sure to keep my expectations in check in case I had to get let down. I am very happy to report that I did not need to take that precaution. The music was consistently fabulous throughout and the story, though complex, was rich with subtlety and interest beyond the main plot. I had the opportunity to meet with a few members of the cast and crew the next afternoon to get further insight into the show. I don’t usually do a full synopsis of the books, movies and shows I review because I don’t like spoilers. But, in my experience with traditional opera one usually knows the story before the performance, which allows the audience to enjoy the beauty of the music and acting without struggling to understand a plot when there are no spoken words. The story takes place in the city of New Albion, which grows and changes into a more industrial and more frightening place as you follow four generations of the McAlistair family through their tales of love, loss and the pursuit of power. The first, Annabelle, is a woman haunted by the voice of her overbearing father and the death of her first love. Though she is expelled from school and shunned by the medical community, she discovers a way to bring back the soul of her dearly departed Jasper and place it into a clockwork body, thus creating the first “doll.” For awhile Annabelle is happy, but Jasper is miserable after being ripped from Elysium and paraded on Annabelle’s arm. As the narrator so poignantly expresses, “that which pleases may not content,” and in the end Annabelle gives him his release in death, and packs away her notes and the clockwork body in the attic. Years later, Annabelle’s formula for raising the dead is discovered by her son, Edgar. He has been recently rejected by Fay, who leaves him for another man. He is committed to winning her back through any means possible, and upon discovering his mother’s secret he creates a commercial empire by selling people the means to bring their loved ones back from the grave. He raises Fay’s father, who it turns out was Annabelle’s Jasper and places him in the same mechanical body. But, Edgar won’t allow Fay to see him unless she agrees to marry him. She is angered and sickened by his manipulation but agrees, and the twice-raised Jasper is trapped once again in his clockwork prison, unable to speak through any means but by channeling radio signals. Their marriage is fraught with anger and resentment, and their son Byron grows up hating his father and his commercial empire, but loving Jasper, his ever-present companion and surrogate father figure. Meanwhile, the city has become overrun with dolls and their exploitation. Death has no longer become an ending, but a transitional phase, and the youth culture has embraced a hedonistic, devil-may-care attitude. Byron is the ring-leader and is trying to lead a political revolution against the corrupt government by actually running a totally disinterested Jasper for mayor of New Albion. Jasper, through his years of taking in songs through the airwaves, creates a lamentation that is soon taken up by all the dolls as they long for an end to their servitude. The sonorous sadness reaches the ears of Amelia, one of Byron’s followers, whose home life and unrequited affections lead her to a feeling of solidarity with the disenfranchised dolls and eventually to her suicide. The angry parents of New Albion turn on the dolls, blaming them for corrupting the youth and riots ensue where the dolls are rounded up and killed. Byron manages to save his dear Jasper from the clutches of the martial law that follows, and then is never lifted. New Albion has become a dark and dangerous place where dolls are killed on the spot and anyone harboring one disappears. Within the walls of his mansion, his daughter Priscilla grows up with Jasper as her dearest friend, and Jasper feels love for her, his great-granddaughter, for the first time since becoming a doll. He doesn’t want to leave her, but longs for his death just the same. He is willing to sacrifice himself for her happiness, but when she finds out about his desire to die she is devastated and can’t stand to keep him against his wishes. She makes the bold and irreparable decision to report herself to the authorities, who arrive swiftly with death on their heels. One soldier hesitates when she looks into Priscilla’s eyes, awash with love and acceptance of her death, which leads to the soldier’s expulsion from the army. She is so moved by her experience that she starts to question an authority that would require her to kill someone just for loving something, and vows to bring the government down. But, as the narrator says, that is a story for another time. It would be a misnomer to call the music of Paul Shapera “catchy” because that sounds too much like a pop song. I think the best, though somewhat graphic descriptor is the German ohr-wurm (earworm) because the songs burrow their way into your brain via your eardrums and come to roost. When I did my interview with some of the Dolls team, Zoe McGee, one of the directors and choreographers of the show, asked me what my favorite part was. I told her it was the song “The Movement”, which comes in Act 3, but after the interview I kept coming up with other favorites and other scenes that I liked just as well. The play is based on a concept album by the same name in 2013, and I think that starting with music that had to stand on its own really added to the overall quality of the songs. The show was first done as a workshop, and later performed with a cast of 14. 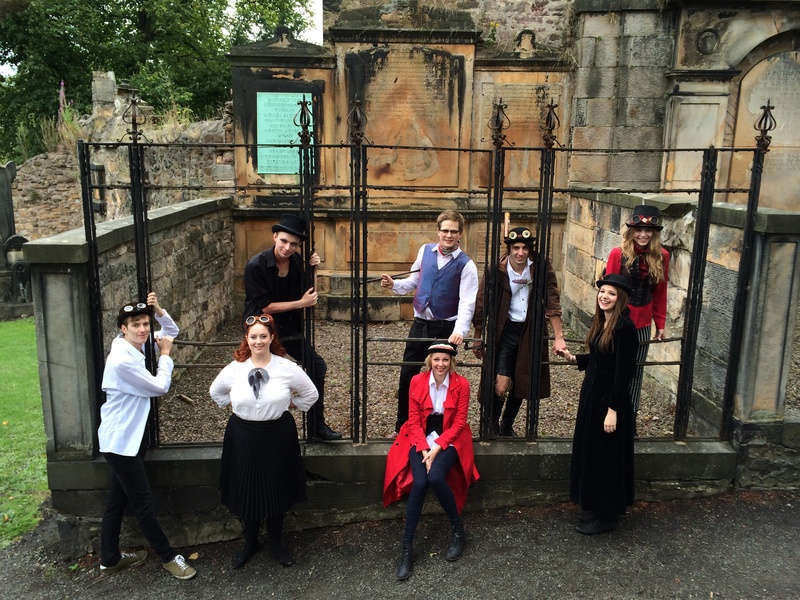 At Ed Fringe, the cast was cut in half and the roles double-cast in order to have a more compact and portable piece. The space at Venue 45 was compact and definitely would have been too crowded with a larger cast, but I couldn’t help but envision this show on a big stage with an elaborate clockwork New Albion rising in the background. The cast handled the quick changes very well and there was never a break in the action except for occasionally within a song when a larger set or a little bit more stage “business” would have given them a chance to keep moving. But, that is often the case with Fringe shows which need to be able to be put up and taken down in 10 minutes to make way for the next show. In lieu of a large set, they cleverly use a pop-up book to show the progression of New Albion as it becomes larger and more industrial, and as a paper artist I especially loved this convention. Emma Fleming (Annabelle, Amelia), says that she prefers the show in the more intimate setting of the small theater, but I could definitely see it being a grand spectacle as well. Overall, I thought this was a fantastic show. 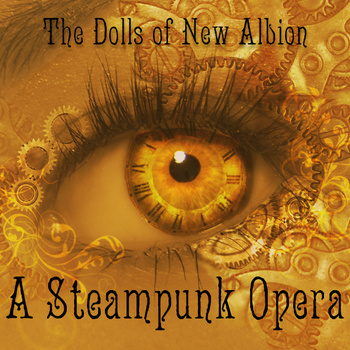 It was the best thing that I have seen so far at the Fringe Festival and I would highly recommend it to not only Steampunk fans, but to anyone who wants to see a dynamic new musical. And who knows, maybe like Jaime Loyn (Edgar, Byron) you will find yourself falling in love with Steampunk because of this show! (Not familiar with Steampunk? 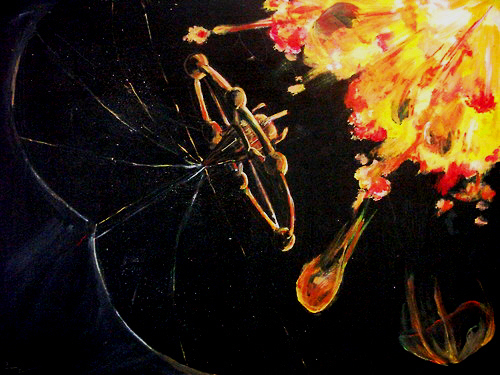 Read more about it on my About Steampunk page.) I have done some acting and directing myself, and my mind is whirring with possibilities. 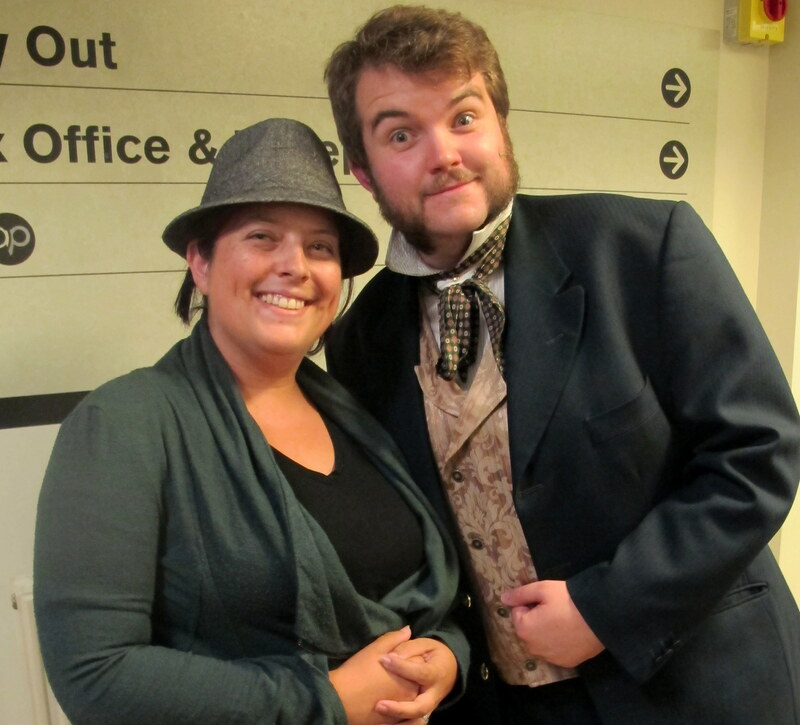 A big thanks to the cast and crew who met me at the Conan Doyle to discuss the show! 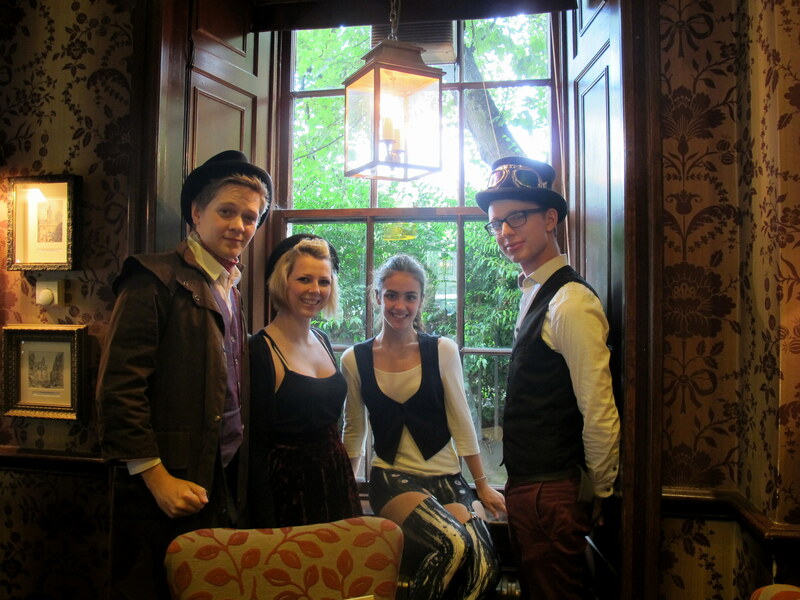 From left to right: Jamie Loyn, Emma Fleming, Zoe McGee, Filip Ferdinand Falk Hartelius. Even though the show starts at 10:45pm, the house was packed, so make sure to get your tickets ahead of time and get their early. There is a little cafe in the lobby and comfy couches so don’t worry about getting stuck out on the windy Edinburgh streets while you wait. The seating area covers two sides of the semi-thrust stage, so I doubt there is a bad seat in the house. You can find the soundtrack available for purchase through Bandcamp, where you can also preview the songs. The composer, Paul Shapera, has also completed two more “punk” operas, and the Clockwork Hart production team tells me they hope to come back to fringe again soon to perform at least one, though it could present some challenges. Filip Ferdinand Falk Hartelius, another director/choreographer of Dolls, told me a bit about the Dieselpunk show and I am very intrigued. It is meant to be less of a stage show and more of a radio show, which could make staging more difficult. It also goes a bit more “meta” with lyrics sung by characters about staying character. 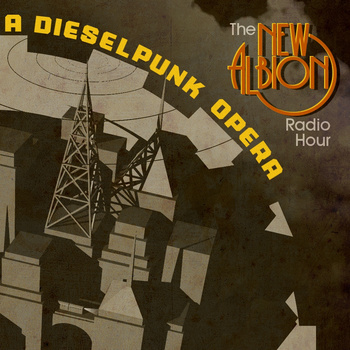 I will definitely be checking out this soundtrack, as well as the Atompunk finale to the trilogy of operas by the talented Shapera.